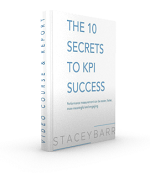 Most organisations have lame corporate KPIs. They don't align to strategy, give evidence of impact, or offer actionable feedback. If they can't do these things, they can't really be called corporate KPIs!